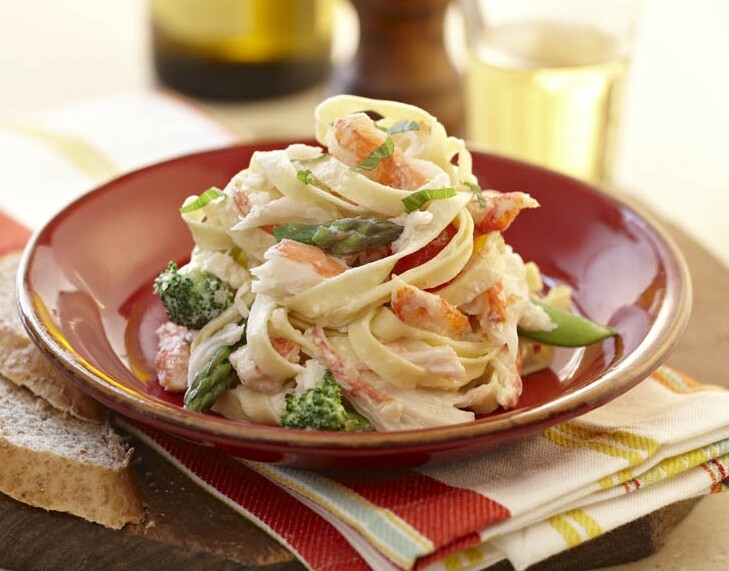 Crab & Seafood Pasta Primavera | Recipes | Oceanfood Sales Ltd.
A delicious blend of King Crab, Snow Crab and Seafood tossed with blanched asparagus tips, broccoli florets, snap peas, baby carrots, cherry tomatoes, fresh garlic and Parmesan cheese tossed in fettuccini. In a hot sauté pan, add a dash of Extra Virgin Olive Oil and sauté asparagus tips, broccoli florets, snap peas, baby carrots, cherry tomatoes and fresh garlic. Add a 1/4 cup of cream and 1/4 cup of grated Parmesan cheese, stir in cooked Fettuccini and Crab Sensations™. Season with fresh basil slivers, salt and cracked pepper.